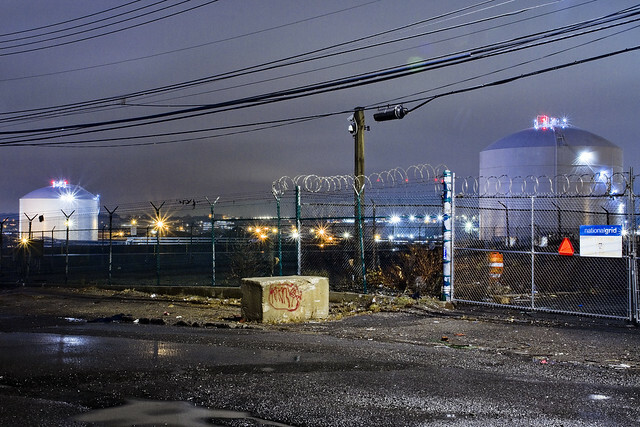 One of the larger properties found along the Newtown Creek is the National Grid site. It’s a bit of black box, Nat Grid, and appropriately a high security “Marsec 1” zone. Marsec 1 is the same security level as the runway of an airport or the bulkheads at a cargo port, and that means a lot of paranoia on the part of those employed in the business of keeping the place secure. The street facing sections of Nat Grid are designed to look like a military base with double layers of fencing topped with razor wire and an obvious series of security cameras pointed at them. There’s also guards patrolling the area. All of this is actually a good thing, as those two white tanks you see above are cryogenic storage units for “LNG” or Liquefied Natural Gas. In the past I’ve indicated that were these things to explode, it would take half of Brooklyn and Queens with them, but the Nat Grid folks have since told me that’s impossible. Were a rupture to occur, they say, it would near instantaneously freeze the surrounding air due to the extreme cold temperatures of the LNG inside and seal the breech. I don’t argue with engineers, as that’s usually an argument you will lose. Lombardy Street is another one of those byways in the Creeklands which is entirely contained by them, and “cul de sac’d.” It starts at Kingsland Avenue a few blocks to the south, and terminates at the water’s edge of Newtown Creek. For most of its course, it defines the western border of Nat Grid’s property line. The Nat Grid property was originally owned by Brooklyn Union Gas, a corporate entity formed in 1825 which consolidated the gas lines of the City of Brooklyn and parts of Queens under single ownership by 1895. By 1910, BUG was operating something like 2,100 miles of metered pipe and manufacturing the gas they sold at a smallish property along the Gowanus Canal in South Brooklyn. By 1928, BUG was pumping some 22 billion cubic feet of gas through their network. They needed to expand their operations, and their source of supply, so in 1929 the Gowanus plant was shuttered and they relocated their facilities to a new 115 square acre property along Newtown Creek in Greenpoint. The BUG people built a manufactured gas plant here, which burned fuel in low oxygen furnaces called “retorts” designed to encourage the fuels to smolder rather than combust. 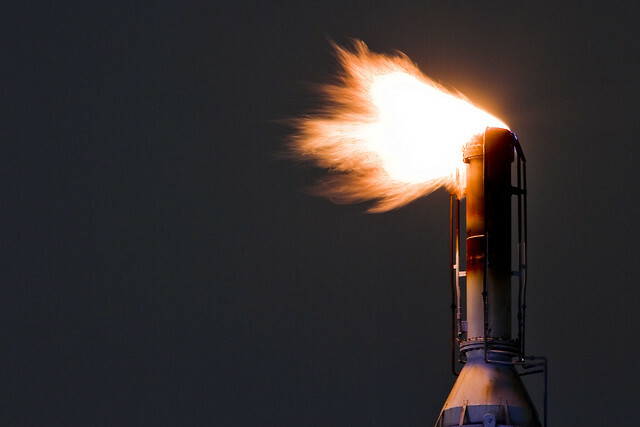 The gases released by the retort were then separated chemically, in pursuit of the manufacture of Methane or “Natural Gas.” There were all sorts of corollary chemical compounds, some commercially desirable, that were released from the fuel. A lot of waste came along with it as well; coal tar, ammoniacal liquors, arsenic compounds. Manufacturing gas can get messy. 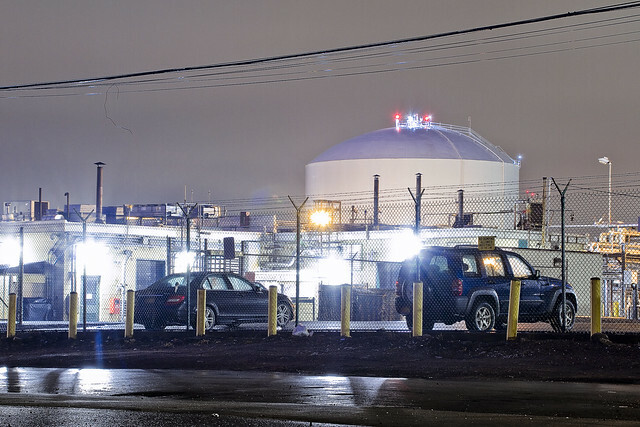 BUG called this site the Vandervoort Street facility, and it was designed to manufacture 200 million cubic feet of gas a day. Through corporate mergers and stock market acquisitions, BUG ended up becoming a part of the Keyspan Company, which itself was acquired by National Grid at the start of the 21st century. 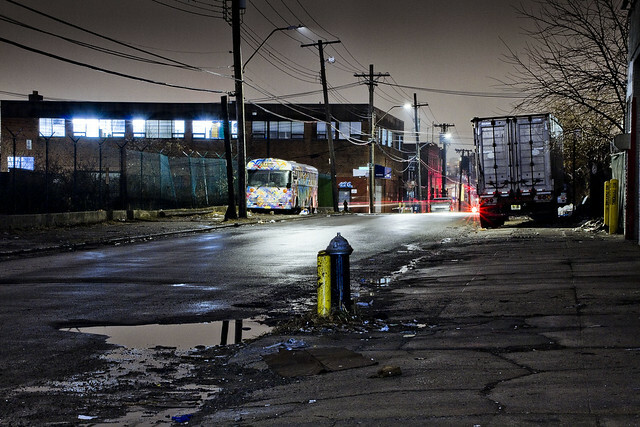 Lombardy Street in eastern Greenpoint/Western Bushwick (depends how you define the areas, by whom, and when) is less than friendly to the itinerant pedestrian under the best circumstances. It’s a heavy trucking backwater, used to avoid getting hung up in traffic on nearby Meeker Avenue. The street itself is an atrocity, missing sidewalks distinguish most of its length, and the vehicle lanes which you’re forced to walk on are so chewed up that it would be quite an easy thing to snap an ankle while scuttling along it. 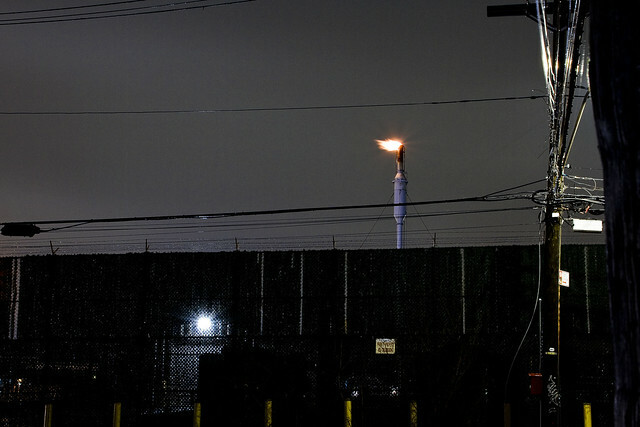 There’s a gas flare tower at the National Grid site which always draws my attention. I’ve been on the Nat Grid site just once, when the company’s PR representatives consented to my multiple requests to “get me smart” about their operations. Unfortunately the visit took place in an office building way on the other side of the site and involved a slide show presentation about their clean up operations for the place. 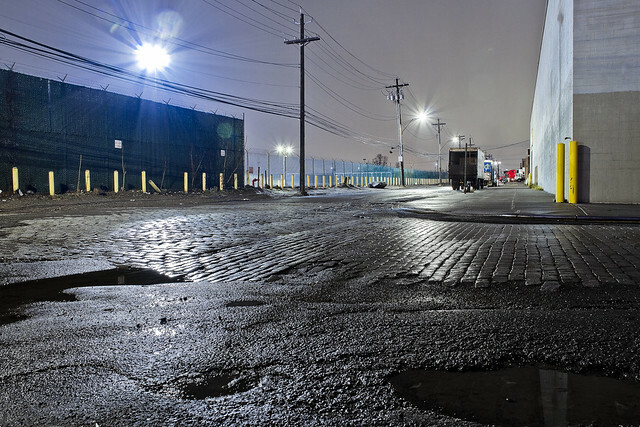 It seems the BUG people left behind quite the mess, which is why National Grid is one of the “Potentially Responsible Parties” named by the EPA as being culpable for the Newtown Creek Superfund site.